Here's my piece for Hels Sunday Stamper challenge 165 with the theme of Sunsets. It's inspired by a post I saw on the Chocolate Baroque blog about sunsets and the Crafty Individuals latest challenge to use bright colours too. It's very simple - I just swiped Green and Yellow Stazon across a piece of gloss card and then sponged Spiced Marmalade Distress Ink (as I don't have an orange Stazon) through a hand cut mask to create the sun's rays. Whitby Abbey is a Crafty Individuals's stamp inked with Jet Black Archival. 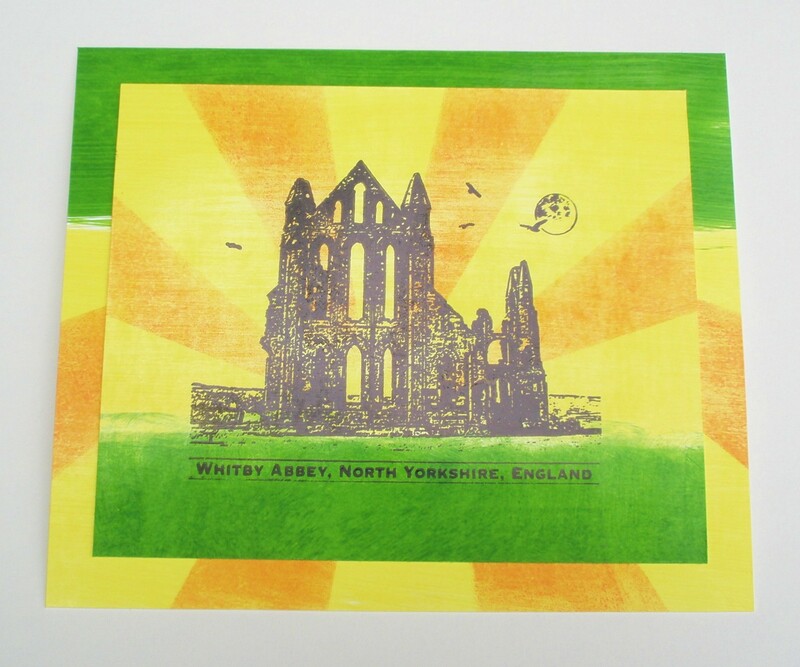 My first attempt had Whitby Abbey elevated off the ground so I had another go - then I've just matted the better version over the top of the mistake to give a frame. I'm leaving it as it is so I can write on the back and send it as a postcard.